All Apple iPad models. Free 3 year guarantee at John Lewis. 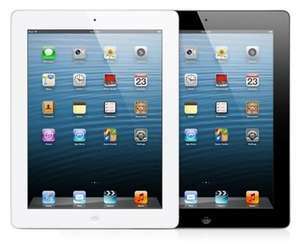 John Lewis are currently offering a 3 year guarantee as standard over their normal 2 year guarantee on all iPad models. This essentially covers everything except accidental damage. This applies online and in John Lewis stores. 3 year guarantee included at no extra cost. Ends 26th August 2013. Probably not. Counts as physical damage so usually isn't covered by most warranties. I'd check to be sure though. Doesn't really seem a good deal to me unless you think it is going to go wrong in the 3rd year, by which time there will be a newer model along anyway. Would prefer a discounted price quite frankly. Considering they will cost the same as they would in most competitors, such as Currys, Argos, the Apple store, HMV etc (and they would price match even if they didn't) Yet you get 2 years extra warranty for nothing seems decent to me. Rather have a discount, iPads rarely fail. Most faults are due to user damage/misuse. I just cracked my screen and no it definitely doesn't, you can get extended warranty from a couple of places (even after the fact) but I just went through my contents insurance. Nice addition to an already decent warranty. Only by people who drop things. Nice addition to an already decent warranty. Only by people who drop … Nice addition to an already decent warranty. Only by people who drop things. Everybody drops things. People who say they don't are lying. Some are more clumsy than others. True, but all it takes is once. Is it a repair or replace policy? It's not an addition. The warranty overlaps. You do not get 4 years of warranty if you're thinking the warranty becomes valid once Apple's warranty ends. John Lewis' 2 year warranty is basically 1 year and 3 year is an additional 2 years. Apple price fix so the same price as everywhere else. This is a deal about a warranty, a person breaking something is nothing to do with a warranty. Isn't there some EU law saying electronic goods should last at least 2 years as standard? Was always under the impression that for manufacturers to claim just 1 year was just ridiculous. My brothers ex-partner works for John Lewis and she said they are doing this because she has heard that apple might be releasing a new ipad either this year or next year so want to entice people to buy these to clear the warehouses. She didn't know much about the new model except that it is likely to be better than the old one. It may be nonsense though as she is my brothers ex-partner and they don't get on ever since that thing with the neighbour across the way so she might be on the wind up. Plus I heard from someone else that she has left John Lewis and now works in Marks and Spencer. But I havn't had that confirmed yet by anyone else. I'm going into town on Saturday after work so will see if she's working in John Lewis or Marks and Spencer. My brothers ex-partner works for John Lewis and she said they are doing … My brothers ex-partner works for John Lewis and she said they are doing this because she has heard that apple might be releasing a new ipad either this year or next year so want to entice people to buy these to clear the warehouses. She didn't know much about the new model except that it is likely to be better than the old one. It may be nonsense though as she is my brothers ex-partner and they don't get on ever since that thing with the neighbour across the way so she might be on the wind up. Plus I heard from someone else that she has left John Lewis and now works in Marks and Spencer. But I havn't had that confirmed yet by anyone else. I'm going into town on Saturday after work so will see if she's working in John Lewis or Marks and Spencer.Hot from me. iPad 5th Gen and iPad Mini 2nd gen (With retina display) are both coming this year, most likely in October. iPad 5 will have smaller bezels and will also be thinner, making approx. 2/3rds of the volume and weight of the current model. It will have the usual spec bumps too. commonly reported issue? maybe by people who keep dropping their stuff..
otherwise these are very well built and sturdy. it's a deal great if you need one asap considering the 3 years warranty by JL,.but new ipad (5th generation) and new ipad mini (2nd generation) will be released in the next 4 months. It's not an addition. The warranty overlaps. You do not get 4 years of … It's not an addition. The warranty overlaps. You do not get 4 years of warranty if you're thinking the warranty becomes valid once Apple's warranty ends.John Lewis' 2 year warranty is basically 1 year and 3 year is an additional 2 years. I am fully aware of that. The standard JL 2 year warranty is nice, and additional year is the nice bit I was referring to, I think most people understood what I was saying. Oh really? I would have never of guessed that. Ipad warranty is a little bit of a gimmick anyway. These sort of electrical products and components are most likely to fail in the first hours/ weeks of use (if anything) , never mind 3 years down the line! and for all those people......also good for kiddies my boy has one he … and for all those people......also good for kiddies my boy has one he likes it. Isn't there some EU law saying electronic goods should last at least 2 … Isn't there some EU law saying electronic goods should last at least 2 years as standard? Was always under the impression that for manufacturers to claim just 1 year was just ridiculous. The Sales of Goods act in the UK overrides this EU directive but usually if you mention it to most major retailers they will honor it. I've done this with amazon and a few other places before and usually as soon as you mention it they offer a refund/replacement/repair. Goods are actually covered for up to 6 years - not 1 year - but after the 1 year warranty runs out it's up to you to have proof that its an inherent fault rather than something you've caused by misuse or overuse. If everyone provided helpful advice like this HUKD would be even better! Anyone found a working price match for the iPads themselves? Doesn't really seem a good deal to me unless you think it is going to go … Doesn't really seem a good deal to me unless you think it is going to go wrong in the 3rd year, by which time there will be a newer model along anyway. Would prefer a discounted price quite frankly. Well you can go to another shop and buy it with a shorter guarantee, but surely a longer guarantee is better making this a BETTER deal than other places. iPad 1 - 2010iPad 2 - 2011iPad 3 - 2012iPad 4 - 2013Oh really? I would … iPad 1 - 2010iPad 2 - 2011iPad 3 - 2012iPad 4 - 2013Oh really? I would have never of guessed that. Deal posting newbie! This is stephen421 first deal post. Help out by leaving a posting tip or just to show your appreciation for their contribution.